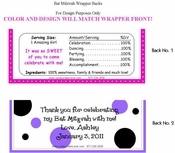 Having a black and white Bat Mitzvah theme? Love zebra prints? Than this is the wrapper design for you. Our ZEBRA PRINT CANDY WRAPPER is so chic and perfect for the occasion.